...and the SpriteExtended class to support Sprites created from trimmed/rotated TextureRegions. Last edited by natypc on Tue Aug 09, 2011 2:25 pm, edited 7 times in total. I'm extending the class to support "rotated" and "trimmed" and allow read Sprites rotated and/or trimmed in the texture to avoid transparent regions and improve texture size. Is done, but the only way I found to do this is creating a transparent Rectangle with the original Sprite size and attach them the trimmed/rotated Sprite with a OffsetX,Y and the rotation if exists. It works and look nice! but... there is any more optimized way to do this using any other AndEngine class instead Rectangle like sprite wrapper? Note: I've improved TextureRegionFactoryJSON and added a SpriteExtended class to easily create Sprites from trimmed/rotated TextureRegions. The code are at first message in this post. 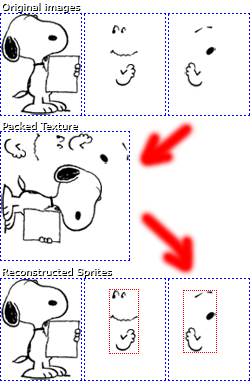 The dimensions of these Sprites are the original image dimensions before trim, but with less texture memory requirements due to transparent pixels trimming. Seriously well done man! Lack of this feature was one of the few things keeping me from going forward with AndEngine instead of LibGDX. Thanks a million. I have been trying for hours but I can't get it to stop crashing....null pointer exceptions everywhere I really hope this new TexturePacker format comes soon with trimming. EDIT: Oops I didnt realize how important that createTextureFromPng line was. It crashed because I left it out....but the SpriteExtended are not working as I expected. They are just showing white squares for everything . Any ideas ? in the SpriteExtended constructor. This prevents shows the superclass white square. Anyway, could you write the code where you create the SpriteExtended? PS: be careful, SpriteExtended is not production code, but a concept proposal. I think it comes from my inexperience with andengine. I never actually loaded the texture.....I didn't know that you had to explicitly do that. I'm getting my bearings bit by bit, but I can't wait for the TexturePacker format. I've been spoiled by Sparrow (iOS) and its perfect integration with TexturePacker. Once that is done I'll surely be able to push out the port to Android.